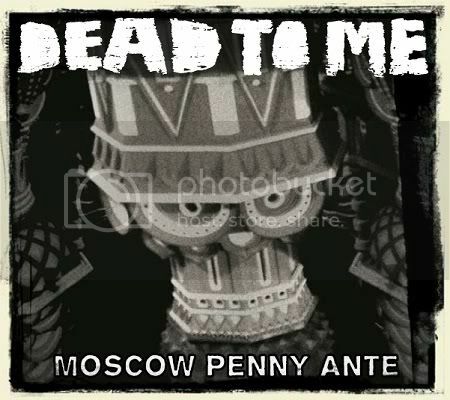 DEAD TO ME Moscow Penny Ante out Oct 25th! Our new record Moscow Penny Ante marks a new page in the story of Dead To Me, and I honestly couldn’t be more proud of it. It’s a privilege to get to make a new full length record with the new members of our band, and their addition to the song writing process has helped for sure. After spreading our wings a little bit on the last album, African Elephants, we ended up writing a much more cohesive, focused batch of songs this time around. I will always love experimenting musically with Dead To Me, and I am very proud that we remain a band that can’t be summed up or pigeon holed with a few " they sound like…" references. However this new record marks a bit of a return sonically to the songs I was writing when I first started the band years ago. The title “Moscow Penny Ante” is a double meaning of sorts. Malcolm X used to refer to small time hustlers and criminals that were scraping out an existence in the Harlem of his early adulthood as “Penny Ante” crooks. Not really big time enough to be taken seriously by the big time gangsters and organized crime members of the era. We felt this term had a proper analogy to our place in the music “industry”. We scrape by and do what we can, but we think we run a pretty good hustle as it were. Hell, it got me all the way from the tiny dirt road I grew up on to Moscow. Who would have thought?